är en ljudkonstnär och improvisationsmusiker från Montreal, Canada. I sina ljudperformance använder hon bl.a. vardagliga föremål ihop med ny teknik för att skapa experimentell elektronisk noise-musik. Hon bor och arbetar för närvarande i Berlin där hon i sitt senaste projekt experimenterat med gamla radioapparater, vilket hon i en konsert form skall presentera för oss. 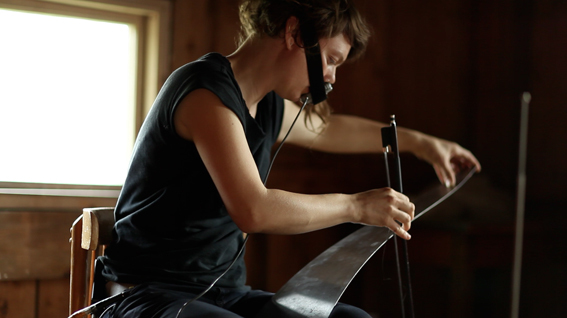 Lisa Gamble is a sound artist and musician based out of Montréal who is known for her noise-electronic improvisations, experimental karaoke and for curating performances in unique outdoors locations. She creates loud, glitch, textural soundscapes with a slight reference to dance music accompanied by lo-fi, circuit bent toys, found objects, musical saw, home made mics, radios, bowed bike wheels, cheap synths, reel2reels and other types of electronics. Gambletron has toured internationally and participated in various festivals and residencies, some of which include the Donau Festival (AU), Nuit Sonores (FR) and Etoilles Polaires (BE).She is also found performing and collaborating in numerous projects on Constellation Records such as Carla Bozulich’s Evangelista, Hrsta, Clues, and Matana Robert’s Coin Coin. She plays with Greenland’s current pop sensation, Nive Nielsen and the Deer Children, and is currently curating Objet inusite in partnership with Eastern Bloc and Suoni Per il Popolo.